devnag preprocessor for the Devanagari LaTeX package. Is there a better alternative to MacDevnag? 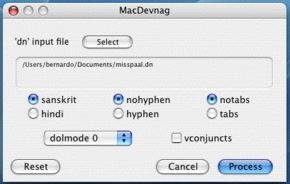 Is MacDevnag really the best app in Language category? Will MacDevnag work good on macOS 10.13.4? The interface has been considerably simpified: from a single main dialog, one can set all the parameters and options and launch the processing. Help tags convey info about each item. Scriptability has been enhanced: you can convert a file or simply a piece of text from AppleScript scripts. one can Drag and Drop a file's icon from the Finder onto the main window to have this file automatically selected as an input file. 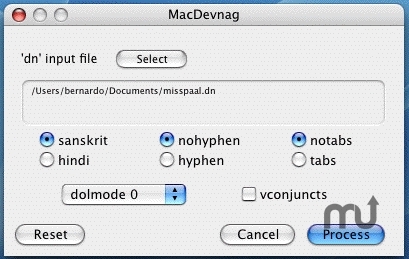 MacDevnag is now localized for the dutch language (the application is already localized for english, french and italian). Still looking for contributors to help adding other languages (only a few strings to translate. See instructions in the package). MacDevnag needs a review. Be the first to review this app and get the discussion started! MacDevnag needs a rating. Be the first to rate this app and get the discussion started!